Bin's journey to losing nearly 40 lbs. of fat and gaining 15 lbs. of muscle underlines the importance of looking for other health and fitness metrics outside of the number on the scale. Broad-shouldered with a good-natured, booming laugh, Bin’s strong hands are almost always holding a baby or wrangling a toddler. Somehow, he manages to make juggling a busy tech manager role, two babies, and competitive power lifting look easy. Bin has used his love for data and efficiency to optimize his life and routine around what’s most important: his family and his health. This wasn’t always the case, though. When he started on his fitness journey about a year ago, Bin was overweight and sedentary. 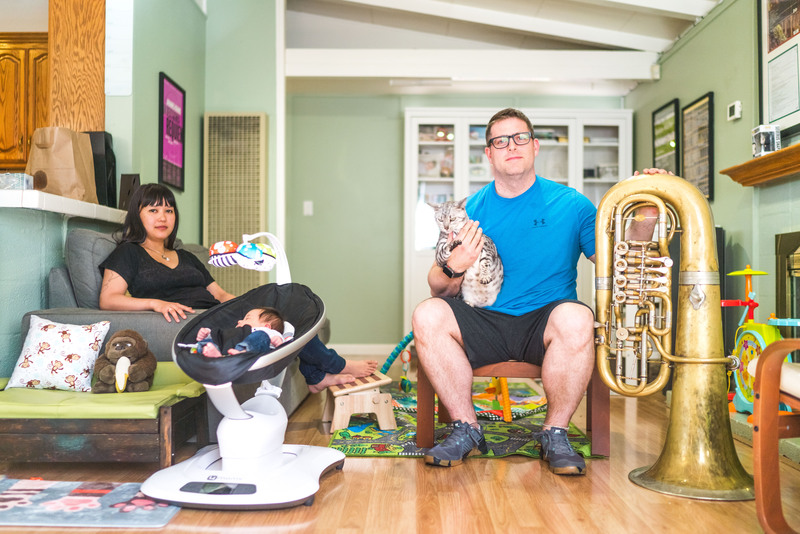 A Juilliard-trained tubist, sports and healthy eating had never really been a part of his life, but the birth of his first baby dramatically changed his outlook. I want to be there for my kids. I want to be able to set a good example for them, and when my kids have kids someday, it’s important to me to be able to chase my grandkids around and keep up. Bin started out by getting a DEXA scan. When he saw his results — 243 lbs. 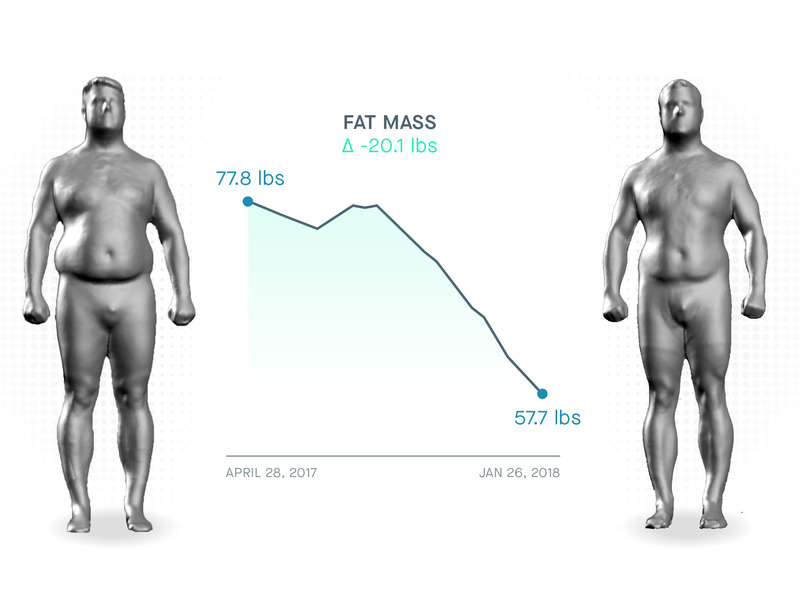 with 32% body fat — he was devastated, it felt like he had a mountain to climb. 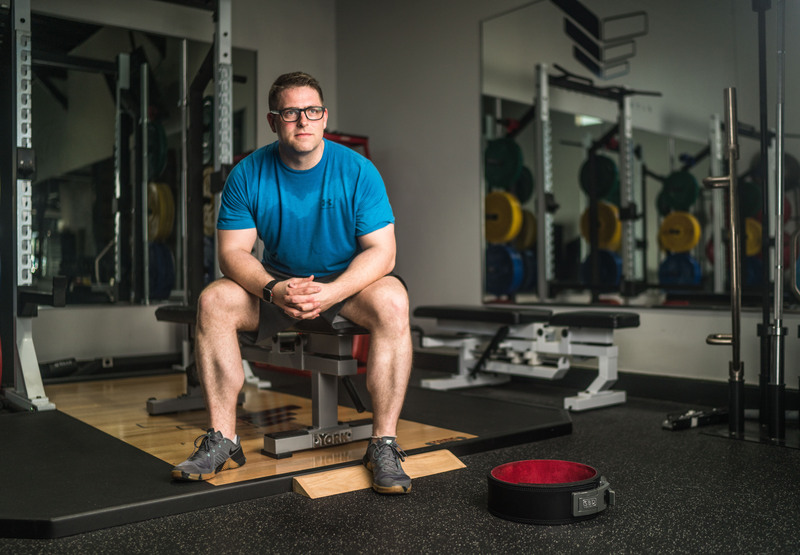 His wife reassured him by reframing the situation: she said, “The only thing that’s changed is that now you know.” Armed with a stellar support system and an infant daughter to motivate him, Bin set out to change his body composition using power-lifting and meal prep. Over the next twelve months, he dropped 20-plus lbs. of fat and gained nearly 10 lbs. of muscle. Even though Bin’s weight only changed by 10 lbs., his body fat went from 32% to 25%. In the past, Bin had tried various workouts and diets to lose weight. He enjoyed hiking and had tried Crossfit, cycling, and running, but nothing stuck. The stress of his Silicon Valley job led to unhealthy habits – including a serious Diet Coke addiction – that workouts alone couldn’t offset. When Bin resolved to finally get healthy after his daughter Penelope’s birth, he began trying various workouts. None of them felt right until a friend introduced him to powerlifting. I realized that lifting heavy weights is something I was good at and something I actually enjoyed. I was finding ways to squeeze in an extra workout because it was fun rather than trying to avoid the gym. Bin began training three times a week at local powerlifting mecca Boss Barbell. Surrounded by people lifting two and three times their body weight, Bin felt inspired to learn the techniques and push himself to lift big. When he began beta testing at Naked, his three-lift total (the sum of his one-rep max for bench press, deadlift, and squat) was around 700 lbs. His goal was to join “the 1000 lb. club,” and nothing would stop him. Meal prep has been crucial to my success. When I am busy with work and lifting, it’s so nice to be able to come home and have the food there. I can spend time with my family instead of cooking every night. Although he’s originally from Virginia, Bin is a Silicon Valley guy through-and-through. A numbers guy, Bin loves data and tracks everything a person could ever think to track. He keeps lists of tasks and goals and tracks his calories and macros religiously, not to mention his workouts and personal records (PRs) in lifting. Naked was Bin’s dream fitness tool. In order to become a better powerlifter, his primary goal was to get stronger and add muscle. 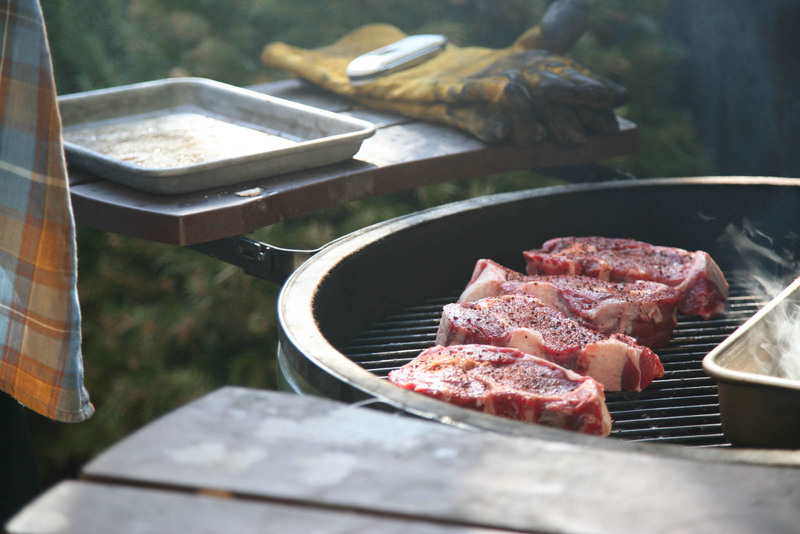 He also wanted to lose fat in order to be healthier, but because significant muscle gain often requires excess caloric and/or protein consumption, the two goals seemed to be at loggerheads. Bin worked with a nutritionist to develop a meal prep plan. A true pit-master, Bin takes Sunday afternoon to smoke turkey, pork, and brisket in his backyard. Then he meticulously measures and portions a week’s worth of meals, including veggies and healthy carbs, into a waiting army of Tupperware. He even meal preps his cats and tracks their macros so they stay lean, using special hi-tech bowls that read a chip on each cat’s collar – no stealing allowed! 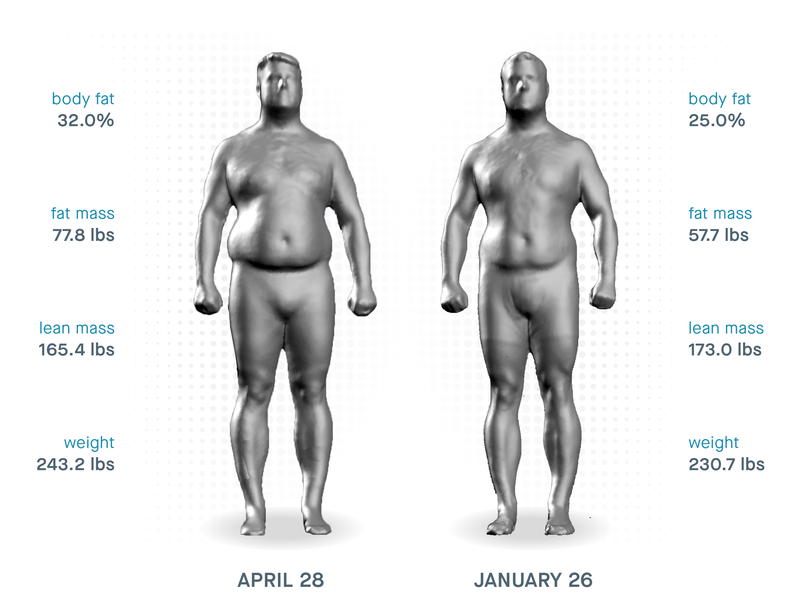 For the first four months of Naked beta testing, Bin’s weight didn’t change more than a pound or two. This was the point when he had given up and quit his diets in the past. This time, though, Bin looked to his Naked scans and measurements to stay motivated. He saw that even when the scale didn’t move, his waist was shrinking – and he could see how different his body looked from the one scan to the next. Being able to see the scans side-by-side gave me objective feedback even though the scale wasn’t moving. Without that feedback, there’s no way to stay motivated because you have no idea if you’re doing the right thing. During that four-month period, Bin gained about 5 lbs. of muscle. This increase in muscle meant that his body was burning more calories each and every day, which helped jumpstart his weight loss. Motivated by the changes he saw in his scans and his Naked data, Bin stuck with his workouts and meal prep, and soon enough, his fat mass started to drop as his lean mass continued to grow and his lifts kept increasing– every powerlifter’s dream! As always, life has its ups and downs. During his fitness journey, Bin has dealt with setbacks, stress, and injury. Trying to move hundreds of pounds at once is not easy on the body, and Bin struggled with muscle spasms, and tendinitis, and arthritis in his knees and shoulders. Throughout this period, Bin relied on physical therapy to be able to keep up with his workouts and avoid further injury as best as he could. Sometimes, though, his body just needed a break. Unable to exercise for a couple months due to a triceps injury, Bin could’ve easily lost motivation and slipped back into his old habits. Instead, he chose to focus his energy on his diet and nutrition in the absence of workouts. He worked even more closely with his nutritionist, stuck religiously to his plan, and saw some of his most impressive fat loss during this period of inactivity. At a different point in my life, I would’ve taken those injuries as a sign to give up or try something else. But now with powerlifting, I am that much more willing to work around my injuries and adapt so I can keep doing what I love. Once his body was ready to get back to the gym, Bin felt motivated by his success and ready to keep chasing his goals. Over the course of the past year, Bin has dropped 20+ lbs. of fat, gained 10 lbs. of muscle, competed in a powerlifting competition, and hit his goal of 1000 lbs. for his three-lift total. He also welcomed another baby girl to his family. In spite of his achievements, Bin views the last year as just the beginning. He’d like to keep competing in powerlifting, lose another 5% body fat, and continue living an active lifestyle for his daughters. Looking back on his fitness journey, the one thing that stands out most to Bin was his ability to stay motivated through plateaus, injuries, and stress. You have to know what success looks like in the moment, and sometimes it just looks like not falling down.